This Stubby antenna makes the CE450 very easy to carry without sacrificing range nor clarity. Power Supply to power multiple CE450 Twin-Chargers. Designed to power up to 8 serial-connected CE450 twin chargers! Simply connect your twin chargers together with cable supplied with your charger, and connect the first charger to this power supply. Convenient and less hassle than plugging many chargers into a wall outlet, this is a must-have for CE450 users! Replacement battery for the CE450 radio. Weighing only approximately 4 ounces and featuring gold-plated contacts, this rechargeable Lithium-Ion battery provides fantastic performance and extended battery life. 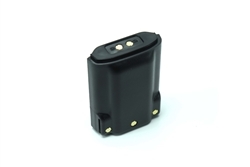 Rated at 2300 milli-amp hour capacity, this battery is superior to most two-way radio batteries. As with all of our products, it includes a 1-year Warranty. Keep all your radios in one place for convenience and security. No more need for a tangle of power strips. The CE450 6-Bank charger is individually electronically controlled. This means your batteries will not be overcharged. This is a rapid rate charger and will fully recharge your radios in only 1 Hour!